The Japanese Kinwashi Paper is made from Kozo and Manila Hemp. 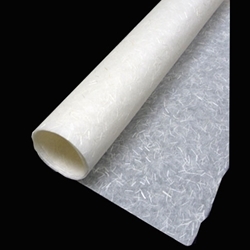 This lightweight paper has textured inclusions, a weight of 30 GSM, and is acidic. This image is the Kinwashi on a black background to show the translucent quality along with the inclusions. Roll measures 38" x 10 yards. Temporarily out of stock for 5-7 days. Type "yes" and order will ship when available. Kinwashi is a traditional lightweight and textured Japanese paper with small fiber inclusions. The translucent quality of Kinwashi is great for any overlay application yet the paper is durable enough for many printmaking applications. This Japanese paper makes beautiful shoji screens, lampshades and is a favorite for batik watercolor.